Detached, stylish & modern villa fully equipped for a holiday in comfort. Peña Blanca (Casa rural) occupies a unique position atop a hill with distant sea views to the South. The Luxury Villa and Swimming Pool boast incredible views in every direction. Designed in style and constructed with comfort in mind, Peña Blanca is a home away from home where every detail has been incorporated to provide a perfect holiday location with modern conveniences included. Peña Blanca Villa is a private home to enjoy and escape the busy everyday pressures. Finished with luxury touches, the Villa is very private, in a quiet situation and not overlooked by any other property. This most stylish villa will appeal to adults seeking a self catering holiday where relaxing ' at home' is a pleasure. The luxury kitchen and bathrooms are decorated to the highest standard using only quality materials. Cooking in the granite topped kitchen can be a pleasure! Outside, the BBQ and Pizza oven are a plus, extending the cooking possibilities. Families will also enjoy the facilities and enjoy walking into Comares village and day trips to the sandy beach, just a 30 minute drive. Local Village - Comares: Comares village is within a 10 minute walk of the villa; or 5 mins by car. Comares sits high on a hill with views to the Mediterranean some 20 kms distant. Its a pretty ' Pueblo Blanco' with narrow streets winding uphill in two directions from the plaza. Although a little sleepy after the busy coast, it has enough facilities for shopping, eating and drinking. The village shop sells fresh bread, veg, meat and has a good beer & wine section. There is also a chemist, tobaconist, 2 restaurants and several bar/restaurants serving meals and tapas. For emergencies, the 24 hour medical centre is a 20 minute drive. Shopping & Beach Life: Velez Malaga is the nearest large town and takes approx 30 minutes to drive to. A lively market town, you will find many supermarkets and an air conditioned shopping centre with multi complex cinemar, bowling and restaurants...This is the nearest town for buying fuel also. Torre del Mar is a popular beach resort with a long sandy beach and Mediterranean promenade. Many beachside cafes are found here, many specialising in fish & seafood. Torre has restaurants to suit all tastes as well as bars and nightlife. Torre del Mar has plenty of entertainment with cycle hire, horse riding, water park and go karting. Along the coast 2kms is the fishing port and marina of Caleta de Velez. Go for a boat ride or just enjoy lunch at the waters edge. 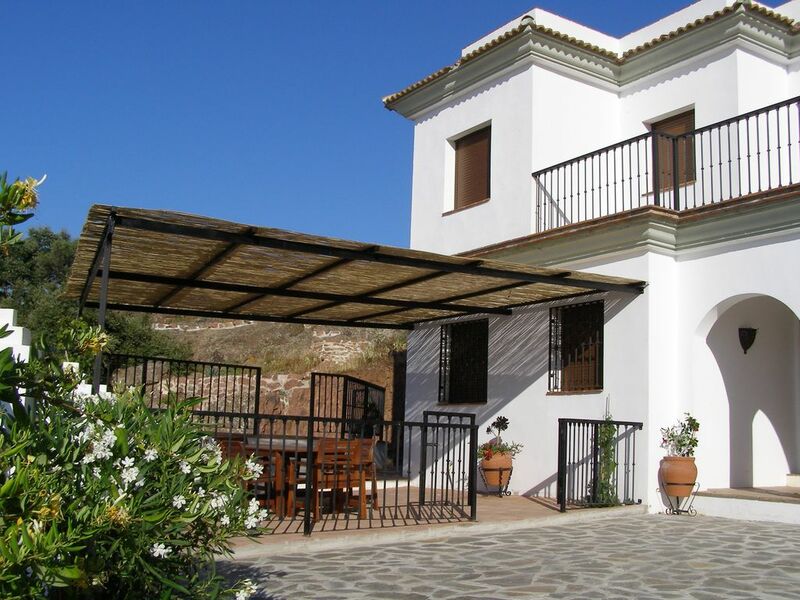 Touring Andalucia: Villa Peña Blanca is a good inland base from which to explore Andalucia. Malaga city has lots to see including the Picasso museum, castle, cathedral and good shopping. Many great tapas bars too! Granada & the Alhambra Palace is approx a 90 minute drive and a must see day trip. Book online in advance. Antequerra and Torcal National Park are nearby too. Nerja, less than an hour by car, has good beaches and famous caves. Seville & Cordoba are a little further on good roads but a worthwhile trip for the more adventurous. Unique location. Private. Several terraces. Excellent views. High quality kitchen equipment, excellent decor and comfort. Walking dstance to the historic village of Comares. BBQ and rustic oven outside. All 3 bathrooms are spacious and finished to a high standard. Bedding provided, sheets, duvet covers, pillowcases. Outside area with table and chairs under a large shadeto eat comfortably al fresco by the pool. We were a bit sceptical when we had to meet at the local bar. But all ok we were met by Carl who showed us to the villa we would never have found the villa with out being guided. Lovely villa with ample room for 6 even thought there was only the two of us on this visit .well stocked kitchen, washing machine dish washer . This villa has amazing views to the sea , extremely quiet. We had a few visits from the ibis and wild cat (ginet) . 40 minute drive to sea and large shopping center. We loved it two blissful weeks in September totally chilled and rejuvenated. Absolutely loved the villa. The setting is absolutely stunning and the ideal place for a get away from it all holiday. The villa has everything you need, spotlessly clean and the views in all directions are amazing from the many terraces. We would highly recommend this property to others. This house is an amazing home from home. The kitchen is fully equipped and the outdoor kitchen is a bonus. The interior of the house is spacious and well finished but the real draw of the property is the outside space. There are several seating ares outside so that you can enjoy the sun, or the shade, all day long. The views go on for miles and seem to change each day. The property is so peaceful that the birdsong can appear loud sometimes. We were lucky to see several species of wildlife around the property including a small group of Rhonda Ibex. The food welcome pack was much appreciated because we arrived on a Bank Holiday and the other extras, such as kitchen roll, dishwasher tablets and detergent etc were an added bonus. Chris and Carl really know how to give you an excellent environment for a tranquil, relaxing break from the hustle and bustle of everyday life. I would recommend this property to anyone and everyone. A glowing review and one we are proud of. A quality welcome pack is provided and is particularly welcome when arriving on a Bank Holiday! Thanks Nikki. Well equipped villa in peacefull location with stunning views. Plenty of places to sit outside. The drive up through the hills to the villa is nothing short of stunning and as you leave the coast behind you can make out the whitewashed town of Comares up in the distance. Eventually the road gives way to track and finally you are there, looking up to the villa. Pena Blanca is very well appointed with all you need for a comfortable stay. It was also spotless. Although we stayed in October we made it into the pool every day: easily one of the most amazing views ever seen whilst swimming! As other reviews allude, the views are simply stunning, with the Med to the south and more mountainous region to the north. Comares itself reminded us of a Greek village with whitewashed buildings and terracotta roofs. I am guessing that in the height of the summer season it can get very busy but in October it was nice and quiet. The walk to Comares takes 10 mins, down the drive and then up a stepped path. Tip: bring a torch if going out for dinner as the path is not lit! Torres del Mar took us 40 mins to drive to and provided a nice contrast to the quietness of the hills. Chris was great to deal with before we arrived and Carl / Maria were on hand during. We would definitely recommend this accommodation and area. We have just spent a week at Peña Blanca. A gem. Thank you Chris. Peña Blanca is situated away from the madding crowds on the coast but conveniently located just a one hour drive from Malaga airport and 30 minutes by car to the sandy beach at Torre Del Mar on the coast. Walking distance from the beautiful village of Comares where all key amenities are found; restaurants, bars, shop, bank etc. Peña Blanca Villa is a good base from which to explore the key cities and sights of Andalucia. Granada & the Alhambra Palace is a day trip. Antequerra and Torcal National Park are nearer still. Seville & Cordoba are less than 2 hours drive. Visit Nerja & the famous caves - 50 kms. Lake Viñuela, Marbella & Puerto Banus are on the tourist lists. Malaga city has plenty of culture with the Picasso museum, castle and many monuments. Great shopping and restaurants too! Please e mail or phone to reserve dates for 24 hours while flights etc are booked. A 25% non refundable deposit is requested to confirm your booking. Full payment details available on request. A discount is offered on bookings of 3 weeks or more. Please ask.